The ERR results of the 2 frequency inversion applied to the CAV contractor delivered data set are shown in Figure 15a, b. The error analysis extends to a 50% threshold (i.e. ERR>50%). The condition RALT>180 m is also shown in Figure 15b. Figure 15 L1 misfit errors (ERR) for the CAV (a) LF and (b) HF data. 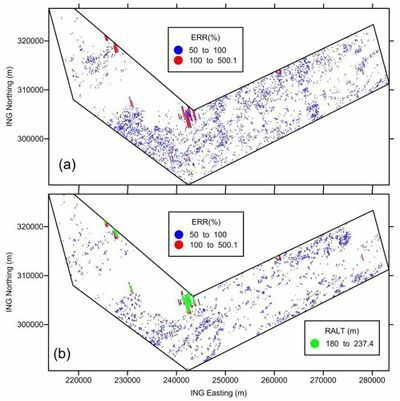 Lower image (b) also shows RALT>180 m.
The major conurbation across the survey area is Cavan (north centre) and this is reflected in both ERR and RALT values. In this largely rural area there are 2506 (from a total of 338725) values with RALT>180 m. There are 14 942 values with ERR>50% (4% of total) in the LF data and 12 827 values (4%) with ERR>50% in the HF data. It can be noted that a 4% culling of the TEL-06 was performed using an error threshold of ERR>100%. Here we use ERR>50% to provide a similar level (i.e. about 4% of the data) of misfit cull. The Cavan data were processed with a rejection level of ERR>50% and RALT>180 m (same RALT as previously). Following inversion, and culling, the Cavan data were levelled using the same FMD parameters as previously (1000 m along line and 500 m across line). The resulting grid images are shown in Figure 16. A detailed examination of the LF behaviour indicates that, despite the advanced processing applied, a number of high conductivity localised and presumably non-geological responses remain. Figure 16 Final apparent conductivity estimates for the CAV survey at (a) LF and (b) HF. 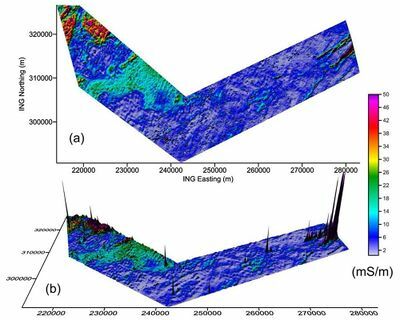 The lower image is shown as a perspective view to indicate the dynamic range of both geological (spatially sustained) and non-geological (localised) influences in the processed data set.